Following a tightly contested affair against the University of Pennsylvania, in which the Drexel University men’s wrestling team managed to hand the Quakers their fourth consecutive loss in the rivalry matchup, the Dragons headed to Raleigh, North Carolina, Jan. 19 to take on arguably their greatest challenge yet this season: the North Carolina State University Wolfpack. Drexel took on the role of the underdogs, as NC State came into the dual meet with a No. 6 national ranking. The 125-pound matchup saw a battle of two freshman as Drexel’s Antonio Mininno faced NC State’s redshirt Zurich Storm. Mininno was only two points behind his opponent going into the final period, but was able to tie the score up after getting himself out of the bottom position. He would not see overtime however, as Storm was awarded a point for his time in control from the top. Storm would go on the defensive, keeping Mininno at bay and the score at 4-3 in his favor. Drexel would even out the score in the wake of sophomore Chandler Olson’s performance at 133 pounds. Olson went up against NC State redshirt freshman John Devine, who Olson took down repeatedly and gained significant riding time over throughout all three periods. Olson would win a 6-0 shutout decision, keeping control on the ground for more than half of the total match time. The momentum gained by Drexel thanks to Olson did not last long however, as the Dragons would go winless in their next three matches. Junior Nick Widmann was pitted against NC State redshirt senior Jamel Morris at 141 pounds, who managed to keep the Drexel wrestler guessing with his shots. Widmann walked away with an 11-0 decision loss, putting the Wolfpack ahead on points once more. Redshirt sophomore Parker Kropman put up a good effort at 149 pounds against NC State’s Justin Oliver, a current graduate student and one of the many top nationally-ranked members of the NC State squad. Despite a promising early offensive showing by Kropman, Oliver’s veteran savvy gave him the advantage he needed to emerge victorious. Oliver took an 11-5 decision, extending NC State’s lead to 10-3. The 157-pound matchup saw two sophomores on the mat as Drexel sophomore Felix Belga took on NC State redshirt sophomore Hayden Hidlay. Hidlay was nationally ranked the No. 4 wrestler at 157 pounds at the time of the bout. Hidlay went on to prove to Drexel why he had achieved his high ranking, as he managed to keep Belga from scoring any points, and eventually earned a 18-0 technical fall win, and pushing NC State to 15-3 overall. Drexel picked up its second win in the 165-pound division in a clash of two top 20 nationally ranked wrestlers. Despite junior Ebed Jarrell being ranked No. 17, two spots below NC State redshirt sophomore Thomas Bullard, Jarrell would prove to be the better man on the day by securing a pin victory over his competitor in 2:17. Jarrell’s win would take the overall score to 15-9, keeping Drexel in contention for the win. NC State would put another nationally ranked wrestler on the mats in the 174-pound weight class. Redshirt sophomore Daniel Bullard was presented with redshirt freshman Bryan McLaughlin as his competition. McLaughlin came out of the gates strong, but Bullard managed to turn the tide in his favor by scoring 14 consecutive points enroute to a majority decision win. While it may have seemed all hope was lost for Drexel, the Dragons found themselves with one more opportunity to pull out a spectacular comeback win in the wake of freshman Anthony Walters’s victory at 184 pounds. Walters was matched against NC State redshirt junior Roderick Davis. Walters was successful on five of his takedown attempts, earning himself a 14-6 majority decision win, and leaving Drexel six points off from tying the score. Redshirt freshman Derek Rose made his collegiate dual meet debut at 197 pounds, but was unable to find success against NC State redshirt senior Malik McDonald, a crafty veteran ranked No. 20 in the country at the weight division. Rose was defeated via fall a little over two minutes into the match, ensuring Drexel finished just short of a miraculous win. The meet was wrapped up at heavyweight where redshirt senior Joey Goodhart earned yet another in a string of recent victories to claim the record of most wins on the Drexel squad with 22. Goodhart outmuscled NC State freshman Colin Lawler 5-0 to end the day on a positive note for Drexel. Drexel wrestling will finish its tour of competitions on the road Feb. 1 at Annapolis, Maryland, against the United States Naval Academy, before returning home to the Daskalakis Athletic Center to host American University Feb. 2. 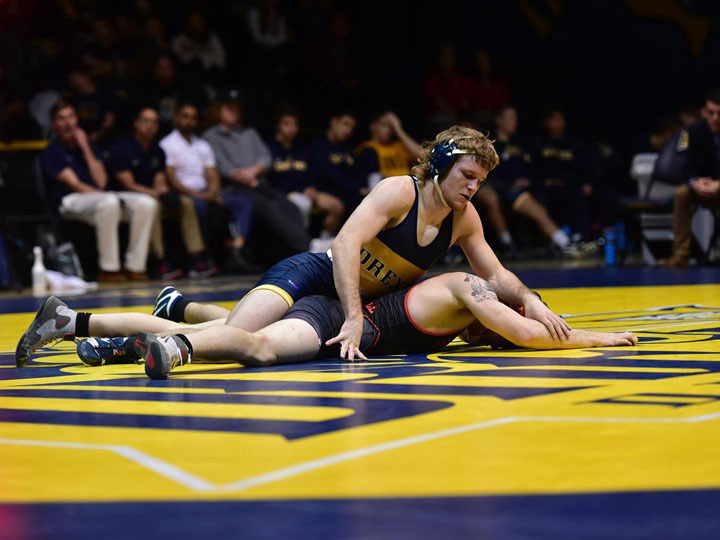 After alternating wins and losses in their past three dual meets, Drexel is hoping to get on the winning path with a win against American, an important rival of Drexel in the Eastern Intercollegiate Wrestling Association.